Taking things apart to create something new is not unheard of in the world of design. In fact, recycling is very much part of everyday life for designers and artists, who strive to turn the old into something innovative, both aesthetically and functionally. Following this simple, unspoken rule, Chilean-born artist Tatiana Pagés began using six-pack rings to make beautiful pieces of jewelry, experimenting with them in order to "inspire people to take action using art and design as the trigger to protect the environment." Now based in New York, in 2009, she launched "A movement that transforms the simple act of recycling plastic materials into a form of creative expression." She called it Origomu, a Japanese word meaning "folding rubber," and from the Japanese she also borrowed the incredible art that makes her pieces so delicate, transforming something ugly and dangerous into striking art. She also invited people to gather plastic for her projects, or to participate with artwork through the website for the movement she created: to date, Origomu has collected over 200,000 six-pack rings not only via the web, but also through art workshops, organizations and contests. "Change your world with your own hands™" is the motto of Origomu, and the contrast between the awfulness of the plastic and the beautiful final results is very much symbolic of the artist's credo. Her pieces are almost organic, their ghost-like transparency is the most striking way of transforming waste into beauty, into something as far from its origin as possible. Through the international design community, Origomu has recently become a global movement, also included in the Museum at FIT and at the Cirque du Soleil VIP Ecological tent in Montreal, as well as used as a business model by international organizations for low-income women. Now Origomu wants to go further: after becoming well known and spreading awareness in the world of art and design, Pagès' goal is to reach further into American society, encouraging the public to help make an impact through this movement. “Origomu will exist until the day we destroy the last six-pack ring,” they say, and we very much believe them. 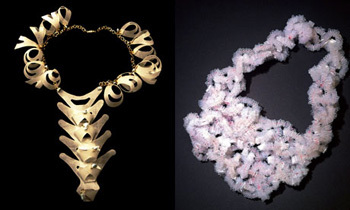 Schmuck aus eher unedlen oder recycelten Materialien ist unter Schmuckdesignern längst keine Seltenheit mehr. In New York ist nun ein internationales Designprojekt entstanden, bei dem Ästhetik, Umweltschutz und soziales Engagement auf ungewöhnliche Weise zusammenspielen. Wie so häufig war es auch im Fall des New Yorker Projekts eine eher traurige Tatsache, die den Beginn der kreativen Aktion auslöste: Jedes Jahr werden Hunderttausende von Meeresvögeln und anderen maritimen Lebewesen von schwimmendem Plastikmüll bedroht. Eine grosse Gefahrenquelle sind vor allem die Sixpack-Ringe, mit denen jeweils sechs Getränkedosen zu einem handlichen Paket zusammengehalten werden. Bei nicht ordnungsgemässer Entsorgung können sich Tiere darin verfangen und qualvoll verenden. Umweltaktivisten raten daher schon lange, die Ringhalterungen vor dem Wegwerfen mehrfach durchzuschneiden. Auf lokaler Ebene in Manhattan begann sie in Workshops andere für die Idee zu begeistern. Mit Erfolg, denn schon bald wurde ein Wettbewerb ins Leben gerufen, zudem fanden sich mit dem Webportal Klimt02 und der Otro Diseño Foundation for Cultural Cooperation and Development zwei internationale Kooperationspartner, die dabei halfen, dass der „Origomu“-Funke rund um den Globus übersprang und sich zu einem regelrechten Lauffeuer entwickelte. „Es ist fast unglaublich: Wir hatten über 300 Teilnehmer aus 25 Ländern, die weit über 500 Entwürfe eingesendet haben“, begeistert sich Tatiana Pagés über das internationale Engagement. Sechs Juroren – Hochschuldozenten, Mode- und Industriedesigner, Fotografen und Stylisten - hatten die schwierige Aufgabe, aus den Einsendungen die besten Entwürfe zu ermitteln. Anfang April wurden die Ergebnisse verkündet. Als Kriterien galten Originalität, die Tragbarkeit des Schmuckstücks und natürlich die neuartige Verwendung der Sixpack-Ringe. Das Ergebnis zeigt erstaunliche Kreationen, von ausgesprochen volumigem bis zu zartem, fast luftig anmutendem Halsschmuck. Der erste Platz ging an Manuela Sousa aus Portugal, die für ihre Kette unzählige Plastikringe mit rotem Faden aneinandergestrickt hatte. Wirbelartig legt sich die Kette „Vertebrae“ der New Yorkerin Anabelle Colon um den Hals der Trägerin. Für ihr Design, das aus sieben Sixpack-Ringen, Messing und Larimar gearbeitet wurde, erhielt die Gestalterin den zweiten Platz. Ebenfalls aus Portugal stammt Estefânia R. De Almeida, die für ihren Halsschmuck „Ebb and Flow“ mit dem dritten Platz ausgezeichnet wurde. Unermüdlich arbeitet Tatiana Pagés daran, das Projekt voranzutreiben. Allein schöne Dinge aus Abfallprodukten herzustellen ist ihr nicht genug. Um nachhaltige Veränderungen herbeizuführen und Verantwortung zu übernehmen, hat sie „Origomu“ zum Business-Modell weiterentwickelt. Gemeinsam mit lokalen Designern veranstaltet sie Workshops, in denen einkommensschwache Frauen ausgebildet werden sowie Frauen, die kurz vor der Entlassung aus einer Justizvollzugsanstalt stehen und wieder in die Gesellschaft eingegliedert werden sollen. Sie lernen, mit den Plastikringen Designentwürfe umzusetzen. „Es gibt nur Gewinner“, erläutert Tatiana Pagés die Idee. „Die Frauen sind kreativ tätig, verdienen ihr eigenes Geld und tragen zum Umweltschutz bei. Das hat positive Effekte für jede Einzelne, aber auch für die Gesellschaft.“ Auch das Business-Modell findet grosse Unterstützung, indem das „Rohmaterial“ gespendet wird: Bis jetzt wurden nicht weniger als 201 772 Sixpack-Ringe gesammelt und an Origomu eingesendet. Jewelry from more base or recycled materials in Jewellery designers no longer a rarity. In New York now an international design project is created in which aesthetics, environmental protection and social commitment play together in an unusual way. As so often it was in the case of the New York project, a rather sad fact that triggered the start of the creative action: Every year, hundreds of thousands of endangered seabirds and other marine creatures of floating plastic trash. A major source of risk is mainly the six-pack rings to six beverage cans are held together in a small package. If not properly disposed animals can get caught in it and torturous death. Environmental activists have long advised therefore to cut the ring supports before throwing away several times. This alone is the designer Tatiana Pagés was not satisfied. The Chilean native who has lived several years in New York and works, has been working for over ten years with the recycling of materials and their use in design. In summer 2009, they dealt with the six-pack rings and custom designed a jewelry collection of the unusual material. 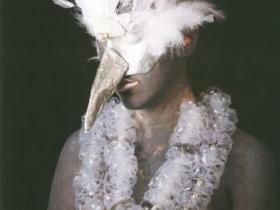 "Origomu" called her the art of making exceptional jewelry pieces from the waste. "Origomu 'means rubber fold' in Japanese, " says the dedicated designer. "I wanted to show what is with all disposable products possible. The collection should serve as inspiration to be creative and also to take responsibility for the environment. " At the local level in Manhattan, she started in other workshops with enthusiasm for the idea. With success, because soon, a competition was launched, also found themselves with the website Klimt02 and Otro Diseño Foundation for Cultural Cooperation and Development, two international partners that helped that the "Origomu" spark jumped across the globe and developed into a real wildfire. "It is almost unbelievable: We had over 300 participants from 25 countries that have sent more than 500 designs, "said Tatiana Pagés excited about the international commitment. Six judges - university lecturers, fashion and industrial designers, photographers and stylists - had the difficult task of selecting from the entries, the best designs. Early April, were announced the results. The criteria were originality, transferability of the jewelry and of course the novel use of the six-pack rings. The result shows amazing creations of extremely bulky to delicate, airy, almost a seemingly necklace. The first place went to Manuela Sousa from Portugal, which together had made ​​for her numerous plastic chain rings with red thread. 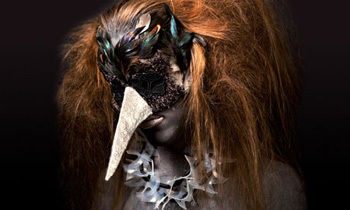 Vortex-like lies down the chain "Vertebrae" the New Yorker Anabel Colon's neck of the wearer. For their design, which was worked from seven six-pack rings, brass and Larimar, the designer got the second place. 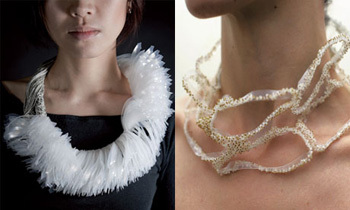 Also from Portugal Estefânia R. De Almeida, which was for her necklace, "Ebb and Flow" won the third place. Tatiana works tirelessly Pagés committed to driving the project. But make beautiful things from their waste products is not enough. To achieve sustainable change and to take responsibility, they "Origomu" to the business model has evolved. Together with local designers, they organized workshops in which low-income women are trained as well as women who are about to be released from a prison and should be reintegrated into society. You learn how to implement with the plastic rings design projects. "There are only winners, " said Tatiana Pagés the idea. "Women are creative activities to earn their own money and contribute to environmental protection. This has positive effects for each individual, but also for society, "Even the business model is strong support by the " raw material is donated ". Until now, no less than 201 772 six-pack rings collected and sent to Origomu. Sí, ha leído bien. Origomu (y no origami) es una iniciativa de la diseñadora dominicana Tatiana Pagés que aúna diseño, joyería, arte, reciclaje, moda... y respeto a la naturaleza. Si algo define a Tatiana Pagés es un indetenible impulso por crear. Publicista, diseñadora de joyas, activista cultural... es difícil retener por mucho tiempo a este espíritu creador en una disciplina. Por eso, que inventara ella misma una, no tiene por qué sorprender. Y que le llame Origomu, tampoco. Tiene su explicación. En japonés origomu significa "plástico doblado", y como técnica aplicada al diseño, se ha convertido en un movimiento con una superficie creativa bajo la que subyace un profundo sentimiento conservacionista. El Origomu, explica Tatiana, recupera los plásticos de los "six packs" de cerveza o refrescos en lata y los manipula hasta convertirlos en objetos únicos de diseño. ¿En qué momento ese plástico, que contamina mares y ríos, que causa la muerte de miles de peces y otras especies, que no se degrada... pasa a ser materia prima de objetos de arte? El proceso de conceptualización y reflexión sobre el daño que nuestro estilo de vida causa, recupera un objeto cotidiano, los aros de plástico del six pack y lo lleva, pasado por el tamiz de la sensibilidad artística, a un espacio diferente en nuestra cotidianidad. En el camino, hemos logrado que esa materia no sea resto, basura, que atente con la vida natural. Ya se han manipulado más de 100,000 aros de plástico. Diseñadores de países tan lejanos como México, Ecuador, Estados Unidos o India se han unido al movimiento. Se han impartido talleres para grupos de mujeres que pueden hacer del Origomu una fuente de ingresos.